Accounts of how this Louisiana classic came about differ, but most agree that the po-boy’s origins date back to New Orleans during the Great Depression. Times were tough and brothers Benny and Clovis Martin served up very generously sized sandwiches of saucy beef in crusty baguette to struggling streetcar workers on strike. The name po-boy obviously has its roots in ‘poor boy’. Fast-forward almost a hundred years and the po-boy endures to this day in Louisiana. Saucy beef fillings are still popular and so too simply fries on baguette – what I think of as a good old-fashioned chip butty. But the po-boy reaches its finest expression when it is stuffed with fried seafood, most especially shrimp or prawns. Crumbed and deep-fried, they make their appearance on baguette rolls along with lettuce, tomato, pickles or cucumber and a cheeky Louisiana-style remoulade with a generous dash of what the Americans so charmingly refer to as 'hot sauce'. 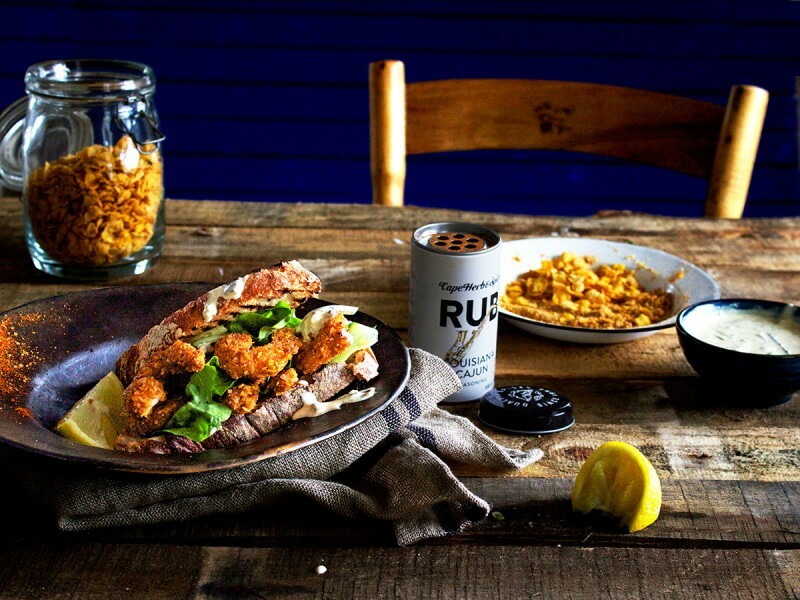 Cape Herb & Spice’s Louisiana Cajun Rub Seasoning is ideal to create your own home version of this very fancy sarmie. Mix all the remoulade ingredients together and set aside. Drop the prawns in the flour ensuring they are coated all around, then shake off any excess. Next, dip the prawns in the egg and then in the crumbs. Deep fry in 5cm oil until golden and cooked through, then drain on a kitchen towel. Serve prawns on baguette rolls with lettuce, tomato and remoulade dressing along with extra lemon wedges on the side.